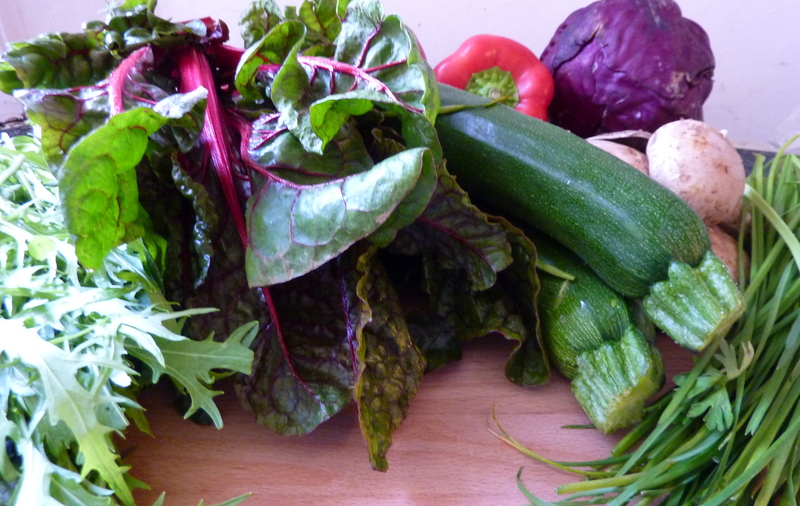 Vibrant, crisp ruby chard, bright green courgettes, 2 firm red peppers, a few chestnut mushrooms and a small red cabbage. Plus the usual potatoes, carrots and onions. The salad bag is a mix of mustard leaves, dandelion, mizuna and baby chard – I usually just wash and dress the leaves with a balsamic and honey dressing or some olive oil and lemon juice. And, best of all, not a sprig of curly parsley in sight! Instead, a bunch of delicate, silky chives just right for the Greek omelette I’m going to make for tonight’s dinner, along with a few other things, of course.